In these days when so many women of leisure devote their time to religious and philanthropic work, the Greyladies' College for Women Workers affords a useful centre for residence and mutual help and fellowship. There is nothing grey about it save the name. It is a delightful country house, once the mansion of Lord Dartmouth, and stands on the breezy heights of Blackheath, in the midst of its own beautiful grounds, and with far-stretching views over the surrounding country to the Crystal Palace. The lady head of the college is Miss Susan Wordsworth, a very earnest Churchwoman, daughter of the late Bishop Wordsworth, and sister of the present Bishop of Salisbury. A worker must have herself well in hand. She must be healthy-minded and sensible with regard to food, rest, and recreation, and unfailingly hopeful. She must be content to work on quietly from day to day without looking for or expecting praise for what she does. She must not try to draw those amongst whom she works to herself personally, and it is deemed better that parish relief should be distributed by an almoner appointed by a relief committee, and not by a Greylady. 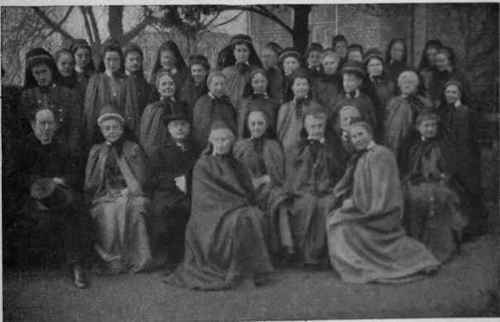 The great aim of the Greyladies' College is to bring together lonely women working in isolation without a definite plan, and also women who are possibly daughters in a large family and find it difficult to separate themselves from social distraction in order to follow religious and philanthropic work. It becomes a great happiness to such to be associated with people who are trying to make the world better. Many women emerge through such association from a life of narrowness and emptiness into one of breadth and satisfaction. The college is described as a society of ladies living together for the purpose of helping in the work of the Church of England under the incumbents of the diocese. The bishop of the diocese has ultimate control over all its affairs. The Greyladies work in twenty-two parishes in South London. There are three classes of members - resident members, non-resident members, and affiliated members. The resident and non-resident members wear the same dress, and are under the same authority. 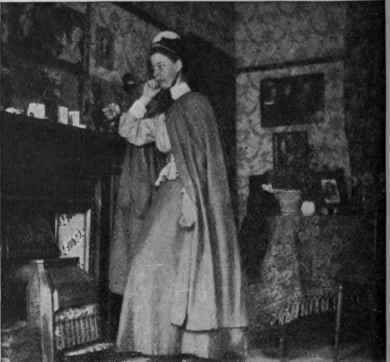 Three months' probation is required before admission as a member of the college, during which time the probationer works under the direction of a Greylady of experience. It may happen that a candidate proves unsuitable for community life, in which case she is advised accordingly, because her admission would interfere with the harmony of the college. It need be no disparagement to the lady personally if she is found unfit for the life of a Greylady. Each lady has her own room, and may, if she wishes, bring her own furniture. Many of the rooms are delightful little sanctums, most artistically arranged. There is nothing ascetic in the college, and every effort is made to make it as homelike and pleasant as possible. There is a large drawing-room for general use, and a pleasant, comfortable dining-room. The flower gardens and conservatory afford interest to ladies who are fond of horticulture. Religion bishop or his representative, and sent forth for work in the diocese. The Bishop of Southwark is president of the college; the Bishop of Kingston visitor; and the Rev. Canon Hough, the Vicar of Lewisham, warden. The treasurer is Charles Stone, Esq. The lady head reads prayers morning and evening in the chapel, and there is midday prayer for those at home. The particular work of each lady is chosen by the warden, after careful consultation with the head of the college. Breakfast over, the Greyladies sally forth in pairs to their respective parishes and respective work, and all that they undertake is done on lines which harmonise with the methods of the incumbent of the parish. They do every kind of parish work, except sick nursing. Some do district visiting, others provident collecting, while others hold mothers' meetings, classes, and clubs, Bands of Hope, and Sunday-schools. Others act as school managers, or serve on C.o.s. committees; some help to prepare the less instructed women and girls for confirmation and communion, and hold a Saturday Church Catechism school for the little ones. Others, again, give short addresses during the dinner-hour in some factory or woodyard where women are employed, or direct a school for mothers. Only those who are working near the college are able to return for the midday meal. Morning, afternoon, and evening bring their appointed work to a Greylady, but matters are so arranged that there is no undue strain upon any. A lady who has had a very full morning would rest a little after lunch, and a lady who had a full a fternoon and evening before her would not undertake arduous work during the morning. Every lady has a complete day every week entirely free from parish work, and at her own comma n d .
She has thus an opportunity for visiting friends, attending a concert or a matinee, or taking a day in the country. The Greyladies are encouraged to foster artistic talents. and a variety of paintings and sketches by members adorn the walls of the college. Some are good photographers. In summer the have parish teapartiei twice a week at the college for girls and mothers, and attend to their guests themselves. Country excursions are also arranged by Greyladies for working girls. Mr. Emerson Bainbridge lends his bungalow at Seaford to the college, and some of the ladies take a party of girls there and live with them for a week. These summer outings have an admirable effect on the girls, and are a source of great pleasure to the Greyladies themselves. Indoor entertainments are arranged in the various parishes for those in whom the Grey-ladies are interested, and these give scope for the exercise of every sort of talent, and many probationers are astonished to find unknown hidden talents when they begin to try to interest others. The admission to this busy hive of religious and philanthropic industry for resident members is £50 per annum in quarterly payments. Ladies who are at work for only part of the year pay one guinea week. When one considers the advantages of living in such an establishment, with full board and a separate room, the l< seem almost nominal. The central idea of the college is to afford ladies of leisure an opportunity to work for the good of others on community principles. Affiliated members are non-resident ladies who desire to promote by their prayers and their benevolence the work of the college. Great efforts are being made to pay off the loans advanced for the building extension. Roches- ter. His sister, Miss Yea m a n whose memory is greatly honoured by Greyladies, was the first lady head. The college was established in its present beautiful quarters in 1907.